As technology marches on, we see a steady rise in the choice of tools available. There seems to be a gadget or tool that will tackle just about everything, and we convince ourselves that we can't possibly be without the most trivial of products that end up sitting in the workshop for years gathering dust. Sometimes we just need to remind ourselves to go back to basics and remember the staple tool of every woodcarver's diet - the humble gouge! There is something about using gouges which can't be beat by even the best power tools. 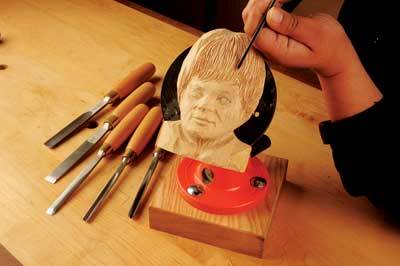 The joy and satisfaction as you slice through wood is simply unrivalled! 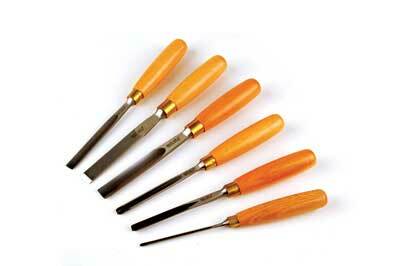 With this in mind, I called in the York set from one of the finest toolmakers in the UK - Ashley Iles. The set comprises of six tools: 5/8in No.1 gouge; 3/8in No.3 gouge; 5/8 No.5 gouge; 1/4in No.9 gouge; 1/16in No.11 gouge; and 1/4in No.39 V-tool. The set is aimed at the beginner, and whilst I don't usually believe there is the perfect starter set out there, these tools certainly provide a good base for which to build on. The tools arrived honed and sharpened, ready for immediate action, which is a nice touch and in keeping from Ashley Iles. so time to put gouge to timber! Starting with 5/8in No.5 gouge and No.1 chisel, I was impressed right away with their cutting capabilities - I could happily rough out large areas of wood all day, just for the sheer enjoyment of it. They cut keenly, accurately and felt just right in the hand - so far so good. Moving on to the finer tools for refining and detailing - again, they performed as well, if not better, than expected. Results were crisp and controlled. And even the V-tool produced some very detailed and delicate results, with beautiful curls coming off the blade as you push through the wood. Yes, I have taken quite a shine to the York set! Whilst they aren't the only tools that you'll ever need, they certainly provide a very good starting point on which to build. The quality of craftsmanship is evident in looks, feel and results, and you'd do well to include this set on your workbench.